Why do seafood choices matter? Approximately 85% of the world’s fisheries are fished to capacity or overfished. We do our part by purchasing sustainably harvested fish to feed our patients. Join us in helping to keep our oceans healthy! The Monterey Bay Aquarium Seafood Watch is a program designed to raise awareness of sustainable seafood among consumers and businesses. In 2013, The Marine Mammal Center became an official Conservation Outreach Partner with Seafood Watch to help promote the importance of sustainable seafood for improving the health of the oceans - a life source we all rely on. We are also part of the Bay Area Sustainable Seafood Alliance, in partnership with Aquarium of the Bay, California Academy of Sciences, San Francisco Zoo, and Monterey Bay Aquarium in raising awareness of sustainable seafood resources and restaurants in the San Francisco Bay Area. The Seafood Watch divides seafood into three catagories based on scientific studies and criteria: "Best Choice", "Good Alternative" and "Avoid". By using this simple guide and making simple choices, YOU can make a big difference for the oceans and all of its inhabitants including our marine mammal patients. Simple actions can make a big difference for the Oceans. and How You Can Help! Scientists estimate as much as 90% of the large predator fish, like sharks, tuna, and swordfish have been removed from the ocean due to overfishing! 85% of the World's fisheries are either fully exploited, overexploited, or collapsed due to overfishing pressures. Three pounds of fish, on average, is required to grow one pound of farmed salmon, making it less sustainable than wild salmon. For every pound of shrimp caught, some fisheries catch, kill and discard up to six pounds of "bycatch" - unwanted fish, turtles, seals, dolphins and more! Your actions count! Everytime you purchase sustainable seafood (or don't buy seafood caught unsustainably) you vote for change! Ask the Important Question: Do You Sell Sustainable Seafood? This 5 minute video produced by the Monterey Bay Aquarium shares the key question you should asking when buying seafood and just how much power each person can have! Sustainable fishing depends significantly on how the fish is caught. Certain fishing methods can have devasting effects on other fish species and the environment. Click here to learn more about different fishing methods! Many great restaurants have partnered with the Seafood Watch program and have committed to only serving sustainable seafood! View the full list here! Download the latest Seafood Watch guides and the Seafood Watch App for your smartphone! Enjoy salmon? What about tuna? shrimp? Find out how you can enjoy your favorite seafood in a sustainable way! Check out the latest new views and videos about sustainable seafood and learn how your daily actions can make a difference! 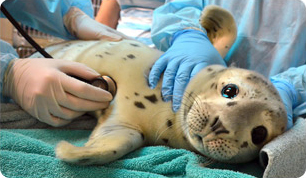 To stay informed about The Marine Mammal Center's work with sustainable seafood, along with our family-friendly programs, patient updates, rescue videos, event info and more... sign up for our free e-mail updates.